I'm cherishing whatever time is left with this girl as our only child. All the feelings.. I has them. I'm an emotional wreck! She's so excited for what's to come - and I love seeing her interact with my belly, and tell everyone all about it. But she has no idea how much her world is going to change - and let's face it, neither do we. This is BIG. For three and a half years, she's been our whole world. For a very large part of that, she was very well going to be it - not for lack of trying, but just because of the heartache of infertility and pregnancy loss. Getting to the stage where things looked good, where we could share the news of a sibling with her - that was a magical moment. Magical, but scary. I always wanted children close together in age, and it was one of the things I really struggled with after we miscarried Noah - they would have been two years apart, almost to the day. Now though? I'm grateful for all the time I've had with this little human - who's growing up so much every day. I've had three and a half years of firsts with her, and those are things I'll never forget. The last few days, her personality has shifted a little; she's over-excited, acting out a bit, just not her usual self. My mum tells me that was something that happened with me as a child just before my brother was born - that they sense that something is changing, and get a bit overwhelmed. I came to a realisation this week - I have completely forgotten about how to parent a new baby. I'm deep in the throes of preschooler-hood, so I'm great at tantrums and bargaining and routines, but I feel like I've blocked out a lot of those early days. 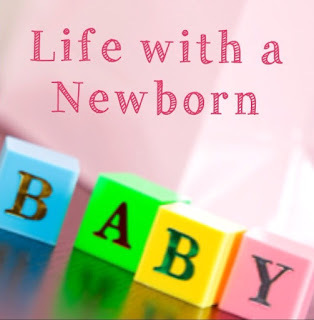 What was some of the best advice that you found helped during the newborn days? Bonus points if it is specifically for baby #2, but I'll quite happily take any and all hints and tips. I think the one thing I'll 'plan' on doing (and I say plan VERY loosely) is to get new baby used to going with the flow with Georgia & I's schedule - because while I had the luxury of doing everything by the baby the first time, we have a lot of stuff that needs doing these days... but we'll see how we go. Otherwise, I think I'll just prepare to be thrown back in the deep end and just see what this little lady's personality is like. Oh my gosh .... I can't believe I'm going to take another little person home with us soon. This is insane! How far along: I am officially the most pregnant I have ever been IN MY LIFE. And not considered pre-term anymore! Sleep: Georgia has been sick again, and has passed it on to me. These seasonal colds are the worst. Best moment of this week: Hitting the 37 week mark. We made it! Miss anything: Nope... I'm feeling good. Movement: Lots of kicks way up high to the rib cage, and hiccups in my crotch. Food cravings: Nothing much this week. Although I kind of feel like a fresh juice right now. Anything making you queasy or sick: Just this chesty cold! How's your mood? I'm excited! I'm scared! I'm proud of myself! I'm petrified! Worried that baby girl is growing rapidly and looking to be a big baby, but also relieved that she's growing well - at least I managed something right this pregnancy. I'm starting to think ahead to actually giving birth & hoping that baby girl might be able to avoid special care - but then, I don't want to get ahead of myself, since you just don't know how labour and delivery is going to go down. Looking forward to: My next OB appt is on Wednesday. I just want to see her again.. if not in my arms yet, on the screen. The Bump: I think it dropped a lot compared to last week, actually. What do you think? I was reading back over my blogs from Georgia's pregnancy, and at 36+4 things had already begun ramping up. A tonne of contractions and some fairly obvious signs that labour was on its way - even if I didn't know it at the time. As for me this time around, well.. I am predicting that nothing will happen on its own. (I KNOW, I can't believe I just typed that - just a gut feeling I have!) I am absolutely massive, but apart from the painless tightenings that I'm having fairly regularly, I haven't had a 'show' yet, and everything else just seems to be hanging on the same as usual. I'd love to push it to Saturday (which would make 37 weeks) just so that I could be considered term. That would be so cool! Otherwise, no news is good news, right? Since my bed rest has been successful, I'm easing my way back into regular activities - even though I am totally puffed doing normal things like walking up my stairs and cleaning the kitchen. Doing nothing for all that time has meant I'm completely useless! Jobs I've managed to complete this week included cleaning out my cupboards, organising and sorting the fridge and pantry, cleaning the upstairs bathroom for the kids, and getting my hair done. Priorities, right? It had been MONTHS since I have had my hair cut, it was in desperate need of some love! I'm off to the OB tomorrow, and I've gotta tell you - I'm so nervous to hear what her weight estimate will be then. How far along: 36 weeks & I'm sort of giggling on the inside; here we are, almost at G's birth gestation - and still baking! How big is baby? 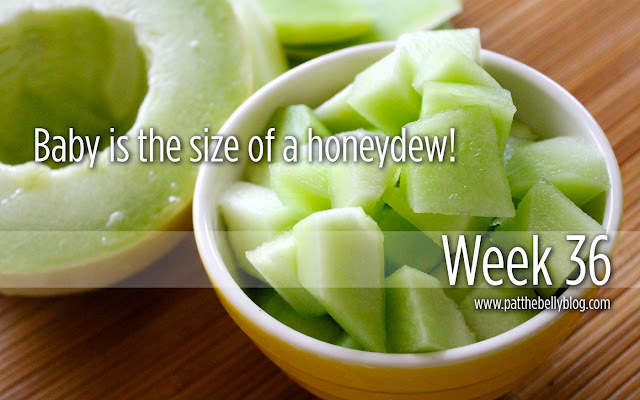 This week baby is the size of a honeydew melon. Which doesn't seem so scary, when it's all cut up. Though since this kid is measuring almost two weeks ahead, perhaps I should jump ahead to the scary beach ball images? Sleep: Taking it whenever I can get it. The usual zombie stagger to the bathroom and back six times a night. Symptoms: Mainly just tightenings this week. Not too painful, just constant. Best moment of this week: Realising that I'm almost at term - the end is drawing near, one way or another! Miss anything: Nope. I will miss this big old belly though. Movement: Still very sporadic, but I appreciate it when she has a little wiggle. A LOT of hiccups this week. How's your mood? I'm actually really, really good. Regardless of whether this kid falls out of her own accord prior to 37 weeks or anytime after that, we're in the home stretch. I baked her through the scary parts, she held on and grew like a champion, and we're almost ready to meet her. I can't wait! Looking forward to: OB appt is on Wednesday, and I can't wait to see her little (or not so little) face again. 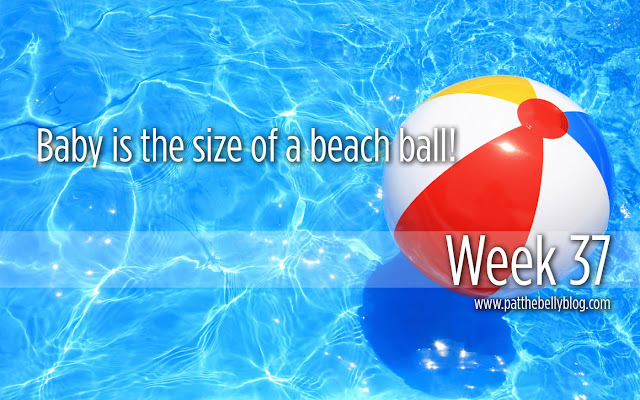 The Bump: Has reached epic beach-ball stage proportions already. Feels stretchy and sore, and my tiger stripes multiplied this week... but it's carried a healthy baby girl (well, two in fact..) and for that I am grateful. It seems hilarious, but at today's OB appointment, we got the great news that all is looking perfect and that my cervix is behaving appropriately - but that baby girl is still measuring HUGE! So while she is healthy, engaged and looking beautifully chubby (which is wonderful) my anterior placenta is making for reduced movements and a little bit of anxiety on my part, so we're starting to look at birth options in case she doesn't fall out of her own accord. Anyway, we have a few weeks to play with to decide what we want to do, but the great news is that I can relax on the bed rest front and go about life relatively normally for these last few weeks of pregnancy. First things first: THE NURSERY! I finally got some time to knuckle down and tackle it - got a few newborn and 0-3 month loads of washing done, and now it's starting to resemble an actual baby's room. Want to see some pics? So we've re-used all of Georgia's old nursery furniture, just changed the theme up slightly. I still need hubby's help to hang up the mirror over the dresser, and a few prints on the walls - but the main stuff is finished. I have somewhere to sit and nurse, the baby has a bed (even though she'll likely be in a cradle in our room initially anyway) and .. it's pretty! OH MY GOSH WE WILL HAVE A BABY WITHIN A MONTH! I'm starting to feel a little bit drained. In a perfect world, I'd potentially still have four and a half weeks to go - so it seems a little bit silly to be this tired this early on. I think it's all mental, though. Let's face it; I've been on constant labour watch since 29 weeks - it's just taken its toll. I wonder how many more weeks we've got in us! In the meantime, who's up for a guessing game? Hair, eyes, date, length, weight.. good luck! Click here to submit your hunch. How far along: 35! 35! 35! Aaaaah! How big is baby? 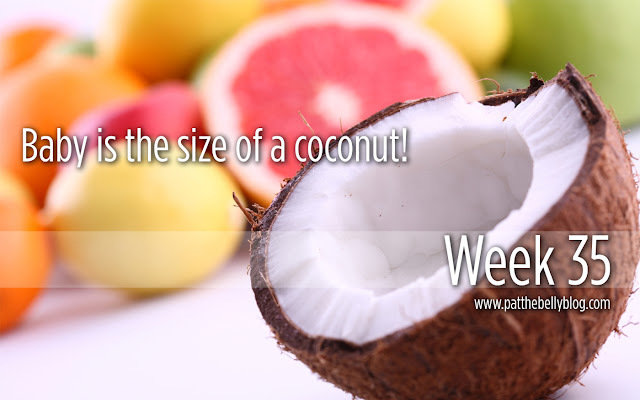 A coconut? A coconut is TINY! Her HEAD feels like a freaking coconut, let alone the rest of her! Sleep: So bad. The late pregnancy insomnia has officially kicked in - can't get comfortable, raging back pain, lying awake and staring at the ceiling... it's so frustrating. Best moment of this week: After a few scary days of quiet movements, she seems back to her normal self a little, so I'm taking comfort in every wiggle. I'll miss the comfort of the movements once she's here. Miss anything: Stinking hot baths. I want to lie in there and shrivel up like a hot, hot prune. Movement: Hit and miss, but CTG monitoring shows she's still doing well, so I'm trying to just be aware. Food cravings: I feel like a Whopper with Cheese. Yep. Hamburgers. Anything making you queasy or sick: Nope. I'm ok, except for the tiredness. How's your mood? I'm so grateful this week! We are at 35 weeks, she's a growing girl with a hefty weight (how crazy going from fearing a premature 29 week infant to anticipating a gigantic baby!) & we have held on this long - life feels pretty damn good right now. 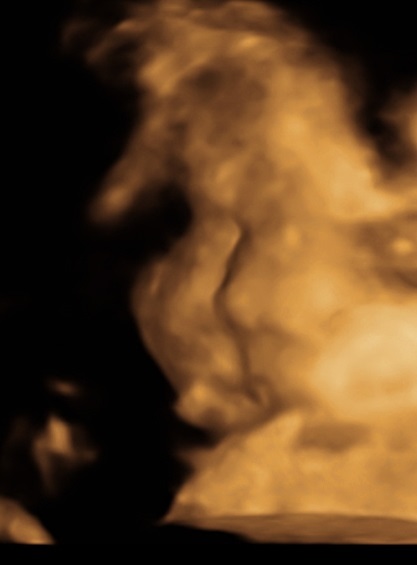 Looking forward to: Meeting this little lady - whenever that will be. The Bump: Waddle waddle waddle. This morning saw me head to the hospital for monitoring, as I hadn't felt baby girl move too much in the wee hours of the evening or this morning. Everything was okay - despite not having any huge movements during the trace, her heartbeat showed appropriate base lines and accelerations - so could well just be positioning or a quiet day. I'm back home now and monitoring some more, but I'll just see my OB as per normal on Friday if all goes well. Despite the fright, I'm glad I went in. It ties in nicely to something (not so nice) that's been on my mind during these last few days - which is an irrational fear of something happening to the baby in the home stretch of this pregnancy. I know it feels silly; we've beaten so many hurdles so far already. From surviving a first trimester where we were sure it was all over, the bleeds, the scares - to the bed resting and threat of pre-term labour early in the third trimester. But the fear of something going wrong now, or of baby being stillborn, it is a real thing. I think a lot of it comes from seeing information scattered on social media, about stories and awareness. It's so important, yes - but it scares me. I just want this baby to get through the last few weeks of pregnancy (if we can stretch that far!) and come out the other side in our arms, safe and sound. Almost 35 weeks... come on, baby girl. We can do this! How big is baby? 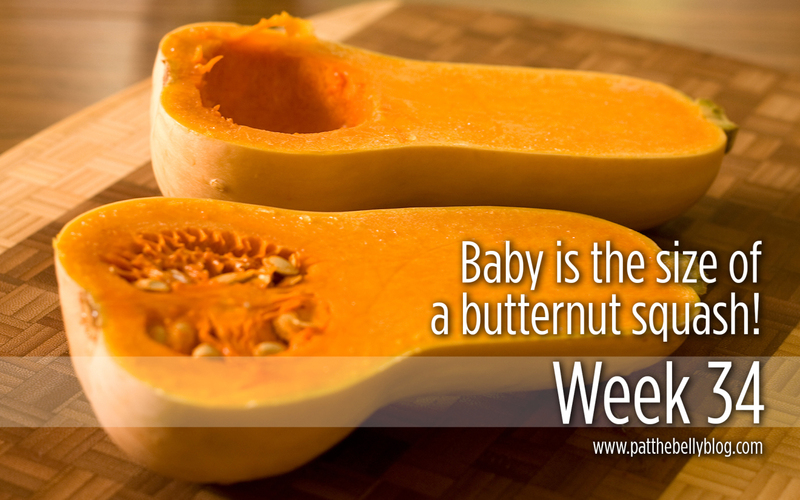 Oh, I do love me some butternut pumpkin.. nom, nom, nom. Sleep: Great, aside from the peeing. Symptoms: It's ALL in my back (and ribs) this week - and painful! Best moment of this week: Just nailing one more week. It's so nice getting great reassuring news from my OB. From now on, baby should hopefully be a-ok after birth, just needing some special care time to help with feeding and what not. I can do this! Miss anything: I have a random desperate craving for big slabs of brie and camembert cheese & a glass of wine. Movement: Quieter this week, except for the odd sharp boot to the ribs. Food cravings: I'm just hungry in general! Anything making you queasy or sick: Nope, all good here. Looking forward to: Next Friday's OB check in - one more week to try and hit, so that I can see the baby again. The Bump: I'm at the point where I'm going to miss the bump again when it's gone. I do so love it. 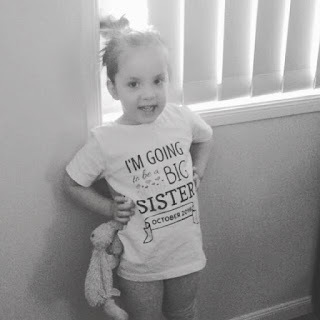 I feel like I should start every blog post with 'I'M STILL PREGNANT!' - huzzah! Somehow we are still hanging on at almost 34 weeks. Baby girl is averaging at 2.38kg (just over 5lbs) so growth is great, cervix has dilated to 2cm now, but membranes are still intact. We might just get to Georgia's gestation (36+) after all! Also... I bit the bullet and ordered a wee personalised swaddle for her, so it looks like her name is set in stone too. I hope it gets here before she does. Here's Squish-face McGee - a shocking photo because of her positioning, but... look at those cheeks! !